Today I had lunch at Cafe Centro, as I often do. A Cobb Salad por aqui, and an iced latte para llevar. On the way out I passed a gentleman in a wheel chair. He’d come in, then turned around, and was blocking the door as I tried to leave. I looked down and saw that he’d dropped a book. I asked him if I could help him, and he smiled “yes”. I gave him the book and then asked if he needed any other help, and he said “no thanks”. 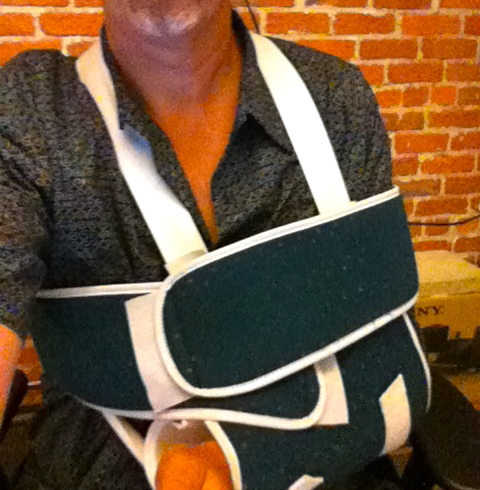 As I left I was struck by my current situation — I dislocated my shoulder at Stinson Beach on Monday and my left arm is in a sling. I was running into the water with my 7-year old, Sebastian, and dove into what I thought was a 3′ wave coming in. The wave turned out to be 2 1/2 feet of foam and 6 inches of water, and my left hand hit the sand and popped my shoulder out of its socket. As I was getting hooked up by the paramedics for the ride to Marin General they said something that made me realize how lucky I’d been — “a couple of inches and it would have been your neck and not your shoulder”. I crossed the street and into the park, and I thought about the minor inconvenience that having my arm in a sling has been. And as I quietly compared it to the man in the wheelchair, or the possibility of having a brocken neck, the inconvenience disappeared into unimportance. I walked across the park and down the alley to Brannan Street, and waited for the traffic to pass. On the other side of the road cars were stopped at 2nd street, and a huge PG&E truck was coming out of Stanford Street honking its horn to be let across traffic. I watched it push its way across the traffic, and I cringed because I could see that the driver wasn’t looking at the traffic, and hadn’t seen the tiny Toyota Corolla with a mother and two children. Whether it was luck, or fate, or angels, the truck missed the car by inches. As it completed its turn and passed me by I looked up at the driver and wiped my brow. He looked down at me, smiled grimly, and wiped his brow back. When I got home I caught up on some reading and came across this poem by Naomi Shihab Nye in a Tim Ferris blog post. It reminded me of Stinson, about the things that had happened at lunch, about how lucky I have been in my life, how handicapped I am not, and the amazing kindness of strangers that I have been privileged to encounter.